Panda presents Agent Alvin. The acclaimed New Zealand Drum N Bass producer is just finishing off collaborations with Viper Recording's own Futurebound which will hit this year. 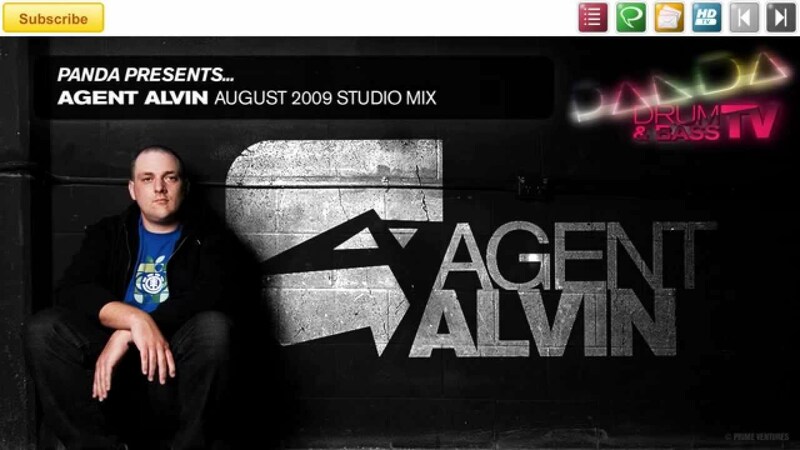 Agent Alvin's single "Don't Look Back" has become a straight-out Drum N Bass hit. Alvin has mixed his most recent work exclusively for Panda Drum N Bass TV. Tune in to hear New Zealand's best. Music has always been a part of Agent Alvins life. Alvin aka Warren Field was brought up on a steady diet of classical composers, later giving way to the experimentation of jazz, rock, funk and hip-hop. It was in his teens that he picked up the guitar and set upon learning everything he could about the music he was listening to. The guitar would have to give way to samplers and keyboards however when Field caught the rave bug in the late 90`s. His first tune, a laid-back dub affair, was released by New Zealands LOOP recordings, gaining nation-wide airplay and hinting at a sign of things to come. In 2004, he released his debut album on New Zealands Capital Records, featuring Spikey Tee, Ruth Minuit, MC Kyla and Meg Martin to great critical acclaim. The self-titled album was nominated for best Electronic release in New Zealands 2005 B-net Awards. It was around the same time that Alvin released his first Drum & Bass 12 with his debut release on the New Zealand based Random Recordings. Fast forward to 2006. It was a big year for the Agent, with tunes released on labels as diverse as the legendary Full Cycle, Klute's imprint Commercial Suicide, Gain, G2 and Resin Records. His tunes were getting airplay on the BBC's Radio 1 by Zane Lowe, Grooverider, Annie Mac and Ras Kwame. As well as high radio play, DJ's such as High Contrast, London Electricity, Roni Size, Pendulum, DJ Craze, The Scratch Perverts and countless others have been playing his music all over the world cementing him as a serious player in Drum and Bass. 2008 heralded the debut release for Agent Alvin on the highly regarded Hospital Records. Super Highway was released on the Friendly Fire EP alongside tracks by Blame, Makoto & T-Ak and Fracture & Survival. This year also saw the release of the massive Wicked Man, featured on the Watch the Ride CD mixed by High Contrast. Wicked Man was picked up by Viper Records and included the long-awaited Dont Look Back on the flip, both of which received support from Radio 1. The Agent has also showed his versatility, with the Autobots picking up two tracks for their Breakbeat label Broke. On the remix tip, the Agent has recently finished tracks for Antiforms Got to be You and The Nomads Sunny Day. Coming up in 2009, look out for a collab with the infamous Futurebound as well as New Zealand's breaks/drum 'n bass rising stars Antiform. 2009 will also herald Agent Alvins first UK/Europe tour.